I can't believe that I have yet to share with you a recipe using crab meat, my favorite food from the sea. I have several crab cake recipes that come in various shapes and sizes. This bite-sized recipe is a good example of the diminutive sort. I started by flipping the portions of crab and cream cheese from the original recipe. It called for 8 ounces of cream cheese and 6 of the crab. I upped the crab and reduced the cheese. Instead of sauteing each individual cake, these are formed in mini muffin pans. The cakes resemble a mini quiche (and with the addition of the cream cheese, they taste like it too). The crust on the bottom and top of the cakes is a mixture of panko breadcrumbs and Parmesan cheese. This mixture becomes golden and crunchy once baked. To keep it simple and let the crab shine through, they are seasoned with just a bit of lemon zest, chives, and cayenne pepper. Not only are they tasty, but they can be made ahead of time. The crab mixture can be made up to a day ahead and the baked cakes up to two hours ahead (this is why I have a picture of the freshly baked crab cakes that we will be enjoying shortly). Just rewarm before serving. This is a crab cake that might even get the non-crab lover to bite. My son doesn't share my love of crab, but he does enjoy the crab and cream cheese goodness in this particular recipe. This is an amuse bouche that is sure to please. In a medium bowl, beat the cream cheese with a hand held mixer until smooth. Add 1/4 cup of the Parmesan and egg; beat to blend. Beat in sour cream, lemon zest, 1 tablespoon of chives, salt, and cayenne pepper. Fold in crabmeat. (Mixture can be made 1 day ahead; cover and refrigerate). Preheat oven to 350° F. Generously butter a 24-cup mini muffin pan; set aside. In a medium bowl, toss together the panko, the remaining Parmesan, and the remaining 2 tablespoons chopped chives. Drizzle the 5 tablespoons of melted butter over, tossing with a fork until evenly moistened. Press 1 tablespoon of the panko mixture into the bottom of each muffin cup, pressing down with the back of the tablespoon forming a shallow cup. Divide the crab mixture (about 1 tablespoon) evenly into each muffin cup. Sprinkle the remaining panko mixture over each cup. 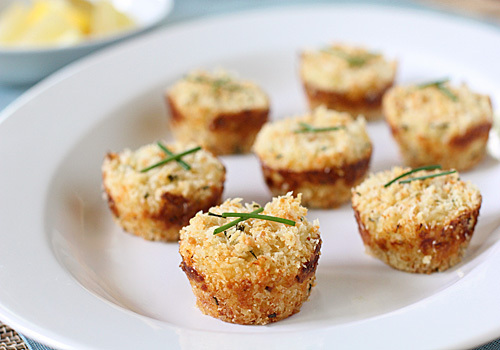 Arrange crab cakes on a serving platter; garnish with chives. Serve with lemon wedges and Tabasco. Holy yum! These look and sound absolutely fabulous, I pinned this recipe! Wow, these look crispy and flavorful! I've been meaning to make crab cakes at home and your recipe is definitely an inspiration to do so! These little cream these crab cakes look so good and cute! Love it. These. Look. Crazy-Good! This is a great twist on crab cakes. I have never thought to add cream cheese to something like crab cakes. It's unexpected yet makes sense. Thanks for sharing!